1. -- U.S. stock futures traded lower on Monday, Sept. 25, and European stocks traded mixed as investors struck a cautious note after Chancellor Angela Merkel won a smaller-than-expected victory in Germany's federal elections and indicated a new government may not be in place until Christmas. The euro weakened Monday after Merkel's Christian Democrats and their sister party, the Christian Socialists, polled at around 32.7% in the national vote, comfortably ahead of the 20.2% earned by their chief rival, the Social Democrats. However, Merkel's party saw a significant slippage in its overall vote share, with a major portion of those lost votes going to far-right parties. Shares in Asian finished mixed ahead of the announcement that Japan's Prime Minister, Shinzo Abe, has called a snap national election and will dissolve the country's parliament later this week as he seeks support for a new government push to revive the country's moribund economy. Ahead of his snap election call, Abe ordered his economy minister, Toshimitsu Motegi, to put together a ¥2 trillion ($18 billion) stimulus package that will pump new cash into preschool education and care for the elderly. As for the U.S., the economic calendar on Monday is light but Federal Reserve officials will be out and about throughout the day: New York Federal Reserve Bank President William Dudley is scheduled to speak at Onondaga Community College in Syracuse, New York, at 8:30 a.m. ET, while Chicago Fed President Charles Evans will speak about current economic conditions or monetary policy at a luncheon in Grand Rapids, Michigan, at 12:40 p.m..
Earnings reports are expected Monday from Red Hat Inc. ( RHT - Get Report) and Ascena Retail Group Inc. ( ASNA - Get Report) . 2. -- General Electric Co. ( GE - Get Report) agreed to sell its industrial solutions unit to ABB Ltd. ( ABB - Get Report) , the Swiss robotics and energy grid conglomerate, for $2.6 billion. ABB will pay just under one times GE Industrial Solutions sales of $2.7 billion and about 12 times the unit's earnings before interest, taxes, depreciation and amortization of $208 million. For GE, the sale is the first big disposal by new CEO John Flannery, who has promised to cut costs and sell operations in a bid to reverse lackluster performance that has dragged GE's share price down almost 17% over the past year. 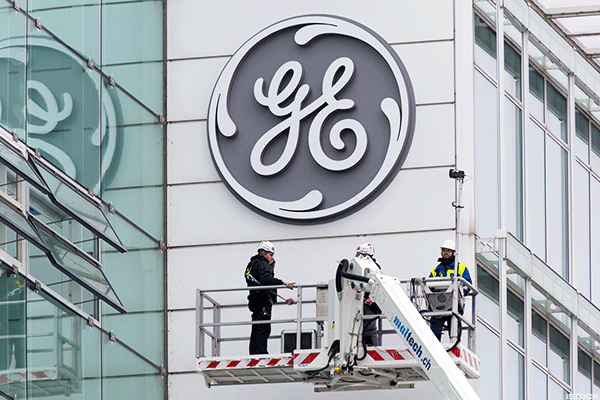 GE shares rose slightly in premarket trading on Monday. ABB shares traded in Switzerland rose 0.5%. 3. -- SoftBank Group Corp. (SFTBY , the majority owner of Sprint Corp. (S - Get Report) , is willing to accept a stock-for-stock merger with T-Mobile US Inc. (TMUS - Get Report) that values Sprint at or near its current market price, Bloomberg reported, citing people familiar with the matter. While the two sides haven't agreed on an exact value, SoftBank doesn't expect to receive much of a premium to Sprint's current share price and may accept a deal that values Sprint, the fourth-ranked U.S. wireless carrier, at roughly its market capitalization of $34 billion, the people told Bloomberg. 4. -- Walt Disney Co. ( DIS - Get Report) has threatened to pull its programming from U.S. cable distributor Altice USA if the two parties can't each a deal before the end of September. Altice USA Inc. (ATUS - Get Report) , better known as Optimum, said Disney had asked it for "hundreds of millions of dollars" in new fees to be able to continue carrying ESPN and ABC, even as ratings suffer, according to Reuters. The two companies have been working on a new contract to replace the one that expires at the end of the month. Walt Disney has said its channels will go dark on Oct. 1, if a new deal isn't worked out. "We are always working hard to negotiate carriage agreements that reflect the best interest of all our customers. We want to carry ESPN and its sister networks, including ABC and Disney, at a reasonable rate and have already offered an increase in retransmission fees and sports programming costs," Altice said in a statement emailed to Reuters on Sunday, Sept. 24. 5. -- R-rated spy comedy "Kingsman: The Golden Circle" displaced horror film "It" as the No. 1 film in North America. The 20th Century Fox release opened with a weekend-leading $39 million, according to studio estimates Sunday. However, "It" still continues to pull in record crowds. With $30 million over the weekend, "It" is now the highest-grossing horror film of all time, not accounting for inflation, with $266.3 million thus far, according to the Associated Press. Updated from 6:08 a.m. ET.